Ekd Gelenkrohr offers System Eltola Plastic Chains. This PVC Link Chain is designed for ease of lifting heavy loads and made by using the highest grades of metal. These chains are mainly used for temporary barricading at parking areas, construction sights and also to block the entry of crowd in prohibited areas. 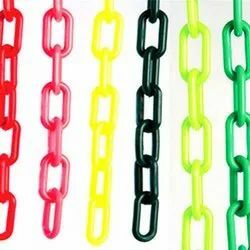 We are the leading manufacturer of Plastic Chain.